In his familiar country of Malawi, Theroux experiences more poverty and crumbling buildings, which were almost nonexistent in the 1960’s. It becomes evient to him that foreign aid isn’t working. When agencies see famine as an opportunity to make money, those people shouldn’t be welcome. He proposes that countries get rid of all foreign aid agencies. In this way, the people would be forced to work, the economy would flourish. In Zimbabwe he sees how this could be effective. The tyrranical rule of their leader Mugabe has led foreign countries to sanction them, thus they don’t receive any aid. Theroux saw that this made the people resourceful. Their markets were full of produce, and generally they had a high stabdard of living. When he entered South Africa, he was almost shocked at all the electrical lights. The darkness of the bush dissolved into the lights and commerce of a western city. He meets with several writers, among them Nadine Gordimer, who wrote extensively about the Appartheid. 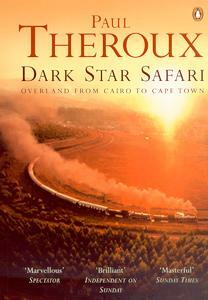 As his journey winds down, Theroux is sad to leave the wilderness and isolation of the bush. Although I found his book very engaging, he did not inspire me to go to any of the countries he visited. In fact I want to avoid them. His descriptions made these places sound so desperate and violent, so barren and cruel, I just than God I want’t born there.